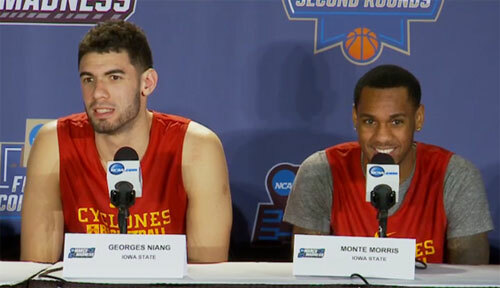 Georges Niang and Monte Morris talk to the media. Fourth-seeded Iowa State is the first of three men’s teams to open the NCAA tourney today against 13th seeded Iona in Denver, Colorado. ISU suffered a first-round upset last year and Niang says they couldn’t forget that if they tried. “I don’t think we can even run from last year — I feel people are constantly reminding us — where if I just want to watch cartoons on T-V I feel like that pops up. But I think the biggest thing is we remember the pain of last year and I don’t think focus is going to be lacking this game. We are taking these guys extremely seriously,” Niang says. Monte Morris says he has recovered from his injury and is ready to play. He says the rugged Big 12 schedule has helped get them ready for the postseason. He says it prepares you to play every night and the seven teams in the tournament speaks volumes about the toughness of the conference. The Cyclones open their fifth straight tournament at 1 p.m. today.